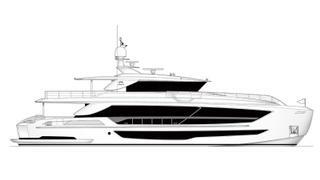 Taiwanese yard Horizon Yachts has sold the second hull in its new FD102 series. The news comes six months after the yard revealed it had begun construction on the first model of the 32 metre series, which was sold to a European owner at last year’s Monaco Yacht Show. The second hull of the Fast Displacement series has been commissioned by experienced American owners, who have previously owned a boat penned by designer Cor D. Rover. The yard hinted that the second model will feature extensive customisation, revealing it was Horizon's willingness to adapt the yacht to the owners’ needs that clinched the deal. It also divulged that the owners plan to put the yacht through its paces with “extensive cruising” in US waters. Due for an April 2020 completion, the second FD102 will be a Skyline version and feature a spacious skylounge with a dining area on the bridge deck. The tender and deploying davit, meanwhile, will be located forward, leaving the aft deck space clear. Accommodation will be for a total of 10 guests comprising a full beam master on the main deck, with four further guest cabins, a king, two queens and a twin, on the lower deck. The main deck will also include a dining area and spacious lounge area leading aft to the swim platform.